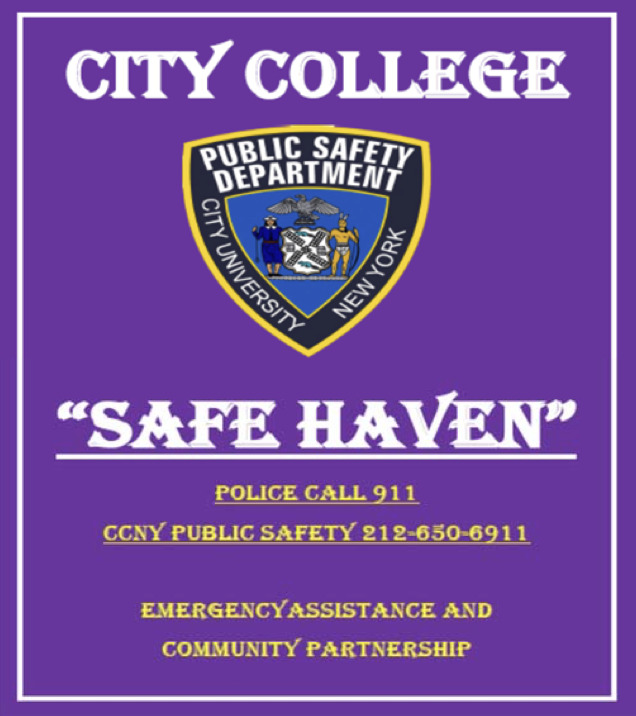 The City College of New York Public Safety Department has started the SAFE Haven Program to assist members of the College community who find themselves threatened, in imminent danger, in need of medical assistance, or if they have been the victim of a crime. The participating local business owners will allow the CCNY affiliate to seek temporary shelter and/or use their telephone to call the CCNY PUBLIC SAFETY Department Emergency number (212) 650-7777, the NYPD at 911 or both. Look for the establishments with the above logo attached to their windows. Please feel free to contact the CCNY Public Safety Crime Prevention Team at (212) 650-7409 with any questions regarding the program. The City College of New York would like to thank all of the establishments for participating in the Safe Haven Program.